A BUR roof system that is shot and leaking gets a restoration face lift with a combination of TritoFlex liquid rubber waterproofing membrane and Supertherm high energy saving ceramic coating. The 20 year-old, built up roof system was subject to deterioration and leaking. The client just finished an extensive interior renovation and needed to get the roof watertight fast. The owner’s concerns included disrupting ongoing training meetings that occur on the top floors of the building, so reroofing noise and odors couldn’t occur. Additionally, there was an ongoing challenge of cooling the upper floors. The owner didn’t believe that the existing roof was energy efficient enough. 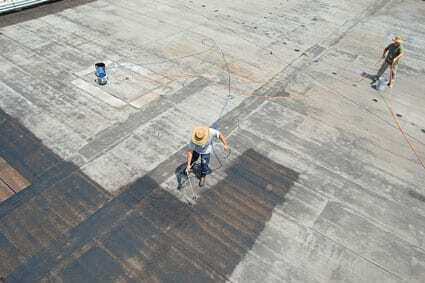 To avoid traditional reroofing noise and odors, the consultant recommended a recovery of the existing roof system with liquid rubber waterproofing membrane system, Tritoflex™, after first performing a moisture scan and replacing any wet areas of insulation. 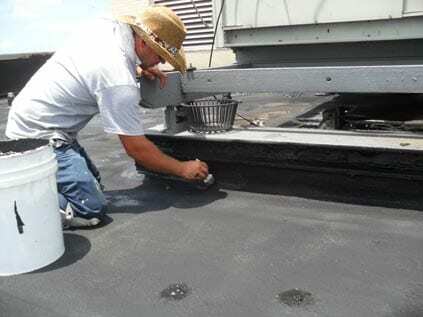 TRITOflex™ is a water-based, liquid rubber system with no VOC’s. Also recommended was a ceramic white coating to be applied over the liquid rubber waterproofing membrane to create a thermal barrier to the sun and its heat absorption to the building. This suggestion addressed the building’s energy deficiencies and facilitated the cooling of the upper floors. The new roof recovery system was half the cost of a replacement system and was completed within 12 days without disturbing the occupants. In fact, the occupants didn’t even realize the crew was working on the roof during their working hours. The client achieved a warranted, watertight roofing system for 15 years at 50% of the cost of a conventional roof replacement and improved their cooling efficiency for the top floors.